Kell Brook pictured in his last fight, a win over Frankie Gavin at the O2 Arena, London. Kell Brook’s trainer says he made the decision to pull the IBF world champion out of Saturday’s show - and dismissed rumours his man had been struggling with weight. Whenever a high-profile boxer pulls out of a contest, there is speculation about the circumstances. 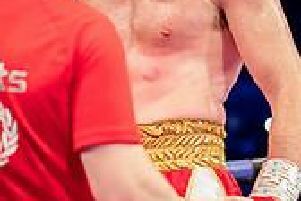 But Dominic Ingle witnessed the crippling body shot in sparring which caused the Sheffield welterweight rib damage. And Ingle stressed: “He has been training for 16 weeks and would not pull out without a legitimate reason. The Star understands that, last Thursday, Brook was sparring Russian David Avanesyan, himself in training for an interim WBA world title match. It was only 10 days before Brook’s Sheffield Arena showdown with Diego Chaves. Ingle said: “It was his last spar. When he boxed Shawn Porter he was sparring up to the Sunday before the fight. “He looked fantastic; Kell was boxing his head off so the other kid went for a change of direction and went for the body and caught Kell in the third round. I have got a video of it. Kell seemed to be running out of gas but went another three rounds. He masked the pain and pasted the kid. “But then he told me: ‘He’s done my ribs.’ When we went to the changing room I could a slight bump developing. “It is very rare for Kell to be caught with a body shot. An injury like that upsets the diaphragm and lungs and it is difficult to breath. Kell had a scan but they can’t say from that if there is a hairline fracture or not, but there is soft tissue damage. “In his fitness and weight he had been in a good place. Kell obviously has to work hard at his weight but he was on target with his check weights. He was looking good. Ingle said, effectively, he took the decision to withdraw from the Chaves fight, which was going to be screened in America.